We already have The Avengers and Justice League, but none of those superhero teams feature Brendan Fraser as a robot. Enter “Doom Patrol,” the second live-action TV series from the DC Comics-branded streaming service, DC Universe. When the series premieres on Friday, think of them as more like a “Justice League” of misfits. Schechter serves as president of production at Greg Berlanti’s production company, Berlanti Productions. She serves as an executive producer on all of Berlanti’s ever-expanding roster of television shows, including the multitude of DC Comics-based shows for The CW and the newly-launched DC Universe streaming service. Starring Matt Bomer, Brendan Fraser, April Bowlby, Diane Guerrero, Joivan Wade and Timothy Dalton, “Doom Patrol” is based on the super team of heroes whose powers have caused them alienation and trauma, created in 1963 by Arnold Drake, Bob Haney and Bruno Premiani. The DC Universe series features original Doom Patrol characters Larry Trainor/Negative Man (Bomer), Cliff Steele/Robotman (Fraser), Elasti-Woman (Bowlby) and The Chief (Dalton), joined by Crazy Jane (Guerrero) from Grant Morrison’s 1989-1993 run, and Victor Stone/Cyborg (Wade). “Doom Patrol” is the second original series in the nascent DC Universe streaming service, which launched last fall. The DCU debuted its first series, “Titans,” in October, and it planning an expansive roster of TV shows based on fellow DC Comics characters including Stargirl, Swamp Thing and Harley Quinn. On TV, however, the CW has its own DC universe that consists of five different shows — and potentially a sixth with the likely series pick-up of its “Batwoman” pilot. That’s a lot of DC shows (and that doesn’t even count Fox’s Batman-prequel “Gotham” or Epix’s upcoming Batman-prequel-prequel “Pennyworth.”). With DC launching its own branded service, does that mean they’ll funnel every pitch toward DC Universe? Schechter likened the difference between “Doom Patrol” and The CW’s roster of DC characters to how Netflix was able to darken the family-friendly nature of Marvel with “Daredevil” and “Jessica Jones.” There’s already plenty of DC heroes on linear television. “Doom Patrol” premieres on DC Universe Friday, Feb. 15. And, no, the extended cut doesn’t do anything that warrants improving its standing. Best known as “the one Shaq was in back when he tried acting,” “Steel” is pretty bad. But the fun kind of bad. Could have been worse, I guess. But it’s still morally gross and has a plot that doesn’t make sense. That it’s very pretty to look at doesn’t override those things nearly enough to make it watchable. Thoroughly horrible, but somehow amusing even so. Sad that it’s seemingly been swept into the litter box of history. Rightly hated, but it’s tremendously entertaining here and there. Uma Thurman and Arnold Schwarzeneggar are going so far over the top I can’t help but admire them. Featured a brilliant corporate rip-off — one later referenced in “Office Space” — but the attempt to funny things up with the addition of Richard Pryor didn’t gel. There was also a weird bit about a weather satellite creating bad weather, which isn’t what weather satellites do. Seeing Clark Kent fight Superman was pretty cool, though. Probably wasn’t intended to be a grim and gritty Shumacher Batmovie, but that is indeed what it is. This is Nolan going full Hollywood, smashing plot points into place by sheer force of will rather than because they make sense. An extremely theatrical Tom Hardy as Bane is amusing front to back, and a nuke with a countdown clock on it will never get old. A total mess that hates Superman and turns Batman into a total maniac. None of those things are good. Ben Affleck can’t save the thing, but he’s excellent nonetheless and gives it a huge bump it probably doesn’t deserve. I have no particular affection for the revered “Watchmen” comic the way a lot of other nerds do, so my distaste for this adaptation isn’t personal. It just doesn’t add up to nearly as much as it thinks it does. Fondly remembered mostly because it was the first Batmovie in a couple decades. It isn’t actually very good, though. The reveal that a younger version of the Joker killed Bruce Wayne’s parents is as hamfistedly dumb as it gets in a “Batman” movie. Felt nothing watching this. I tried, OK. It’s impeccably made, though, and very watchable. Giving this its own slot because it fundamentally changes the narrative of the movie and the character of Superman in the DC Extended Universe. This version is still not great (especially at three freaking hours), but it’s a monumental improvement over the theatrical version. Did you even know these were comic book movies? Whatever, it’s a great cast in a serviceable action movie and everybody’s having a good time. Hard to remember, but fun. Better than its sequel, but they’re basically the same. Hits just the right tone for what Joel Shumacher was trying to do with the two films he directed. Tommy Lee Jones, as Two Face, is doing stuff in this movie that is hard to believe even today, given his perpetual sour face in nearly every other movie he’s been in. Actually a pretty decent attempt by Bryan Singer to do a Christopher Reeve “Superman” movie in the present day, but Brandon Routh couldn’t pull off the charisma it takes to be the Man of Steel. It was his first movie, so that’s not surprising. But it’s a shame, because Routh has gotten much better in the years since. Remember that time they released a “Batman” cartoon theatrically? It gets lost amongst all the live-action ones, but “Mask of the Phantasm” is better than most of them. Should be way shorter, but Heath Ledger‘s Joker is far and away the best villain in any of these movies. Ledger elevates what would otherwise be just another self-indulgent Christopher Nolan exercise into an endlessly watchable picture. Made kids everywhere cry as they watched Superman give up his powers for a normal life with Lois Lane (Margot Kidder). There are different edits of this movie, and we frankly can’t keep them straight. But the sight of a powerless Clark getting beat up in a diner made Superman as sympathetic as he’s ever been. 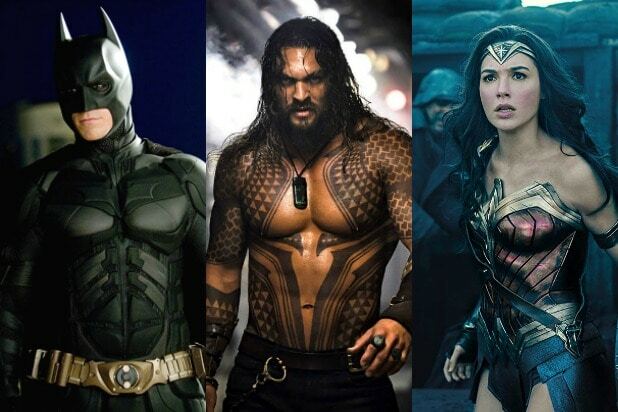 Has the standard origin movie problem of “too much story, not enough time.” And the standard DC Extended Universe problem of “We gotta have a nonsensical CGI battle at the end.” But despite those caveats it’s an enormous delight, and a big step forward for the DCEU. One of the best of the franchise because it’s really just a political thriller. The Penguin emerges from the sewer and runs for mayor of Gotham! It’s great stuff, especially as we continue to watch the rise of Trump in our world. It’s not often that we get a comic book movie that is: full on ridiculous; loves how ridiculous it is; and is made with skill by a legitimately great filmmaker. James Wan’s “Aquaman” is all of that, and it’s just a wonderful experience. This is the gold standard of Superman movies, and was the best superhero movie bar none for many, many years. John Williams’ score soars, and so does the believable and compelling romance between Superman and Lois Lane. The film convincingly blended camp (in the form of Gene Hackman‘s wonderful Lex Luthor), an epic origin story that actually felt epic, and funny lines. The scene in which Supes and Lois fly together is one of the most beautiful metaphors for new love ever captured on film. Has a timelessness that none of the other films do, and it’s just a delight from beginning to end thanks to Adam West‘s winking Batman and the coalition of villains who can’t stop cackling maniacally. Watching it again recently, I found it functions almost perfectly as a parody of the super-serious Christopher Nolan Batfilms, which is incredible. The most complete film, on its own, in the entire live-action franchise. It’s just, like, a regular movie… except it’s about Batman. It has actual characters and everything, and Christian Bale‘s Bruce Wayne even has emotions. It’s weird.